One of the most important thing to look for in a contractor is their credentials. Its ideal to choose a contractor with years of experience and a trusted reputation. You can ask your friends for recommendations or check sites like the Better Business Bureau for reviews. With over a century of experience and a solid A rating on the BBB, you can count on us for quality services. When selecting a contractor to h andle your replacement windows in St. Louis, consider their character as well. Choose a contractor that you feel comfortable with and whose work satisfies your needs. Hire someone whom you can easily talk to and is on the same page as you on the project. You can check what some of our clients have to say by going to our Reviews page. Before starting your project, be sure to have every detail of it in writing. The contract should indicate the beginning and end dates, coverage of the work, the materials, and the payment schedule. This helps resolve conflict quickly and efficiently. It also ensures that your project is on schedule and on budget. 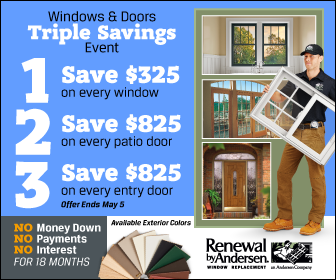 For your next home improvement project such as replacement windows and doors in St. Louis, look no further than Renewal by Andersen. We offer high-quality and energy-efficient units that can beautify and protect your home for years. Call us today at (314) 332-2364 to discuss your next project. You can also fill out our contact form to schedule a free in-home consultation.